A hurdle rate, which is also known as minimum acceptable rate of return (MARR), is the minimum required rate of return or target rate that investors are expecting to receive on an investment. The rate is determined by assessing the cost of capitalUnlevered Cost of CapitalUnlevered cost of capital is the theoretical cost of a company financing itself for implementation of a capital project, assuming no debt. Formula, examples. The unlevered cost of capital is the implied rate of return a company expects to earn on its assets, without the effect of debt. WACC assumes the current capital, risks involved, current opportunities in business expansion, rates of return for similar investments, and other factors that could directly affect an investment. Before accepting and implementing a certain investment project, its internal rate of return (IRR)XIRR vs IRRWhy use XIRR vs IRR. XIRR assigns specific dates to each individual cash flow making it more accurate than IRR when building a financial model in Excel. The Internal Rate of Return is the discount rate which sets the Net Present Value of all future cash flow of an investment to zero. Use XIRR over IRR should be equal to or greater than the hurdle rate. However, most importantly, any potential investments must possess a return rate that is higher than the hurdle rate in order for it to be acceptable in the long run. What are the methods used to determine a hurdle rate? Most companies use their weighted average cost of capital (WACC)WACCWACC is a firm’s Weighted Average Cost of Capital and represents its blended cost of capital including equity and debt. The WACC formula is = (E/V x Re) + ((D/V x Rd) x (1-T)). This guide will provide an overview of what it is, why its used, how to calculate it, and also provides a downloadable WACC calculator as a hurdle rate for investments. The stems from the fact that companies can buy back their own shares as an alternative to making a new investment, and would presumably earn their WACC as the rate of return. In this way, investing in their own shares (earning their WACC) represents the opportunity cost of any alternative investment. Another way of looking at WACC is that it’s the required rate of return investors demand from the company. Therefore, any project the company invests in must equal to (or ideally greater than) it’s cost of capital. A more refined approach is to look at the risk of the individual investments and add or deduct a risk premium based on that. For example, a company has a WACC of 12% and half its assets are in Argentina (high risk), and half its assets are in the United States (low risk). If the company is looking at one new investment in Argentina and one new investment in the United States, it should not use the same hurdle rate to compare them. Instead, it should use a higher rate for the investment in Argentina and a lower one for the investment in the U.S.
What factors to consider when setting a hurdle rate? In analyzing a potential investment, a company must first hold a preliminary evaluation to test if a project has a positive net present value. Care must be exercised as setting a very high rate could be a hindrance to other profitable projects and could also favor short-term investments over the long-term ones. A low hurdle rate could also result in an unprofitable project. Risk premium – Assigning a risk value for the anticipated risk involved with the project. Riskier investments generally have greater hurdle rates than less risky ones. Inflation rate – If the economy is experiencing a mild inflation, it may influence the final rate by 1%-2%. There are instances when inflation may be the most significant factor to consider. Interest rate – Interest rates represent an opportunity cost that could be earned on another investment, so any hurdle rate needs to be compared to real interest rates. How to use the hurdle rate to evaluate an investment? The most common way to use the hurdle rate to evaluate an investment is by performing a discounted cash flow (DCF)DCF Analysis InfographicHow discounted cash flow (DCF) really work. This DCF analysis infographic walks through the various steps involved in building a DCF model in Excel. analysis. The DCF analysis method uses the concept of the time value of money (opportunity cost) to forecast all future cash flows and then discount them back to today’s value at the hurdle rate to provide the net present value. In order to do this, the company needs to perform some financial modelingWhat is Financial ModelingFinancial modeling is performed in Excel to forecast a company's financial performance. Overview of what is financial modeling, how & why to build a model. A 3 statement model links income statement, balance sheet, and cash flow statement. More advanced types of financial models are built for valuation, plannnig, and. The first step is to model out all the revenues, expenses, capital costs, etc in an Excel spreadsheet and develop a forecast. The forecast needs to include the free cash flow of the investment over its lifetime. 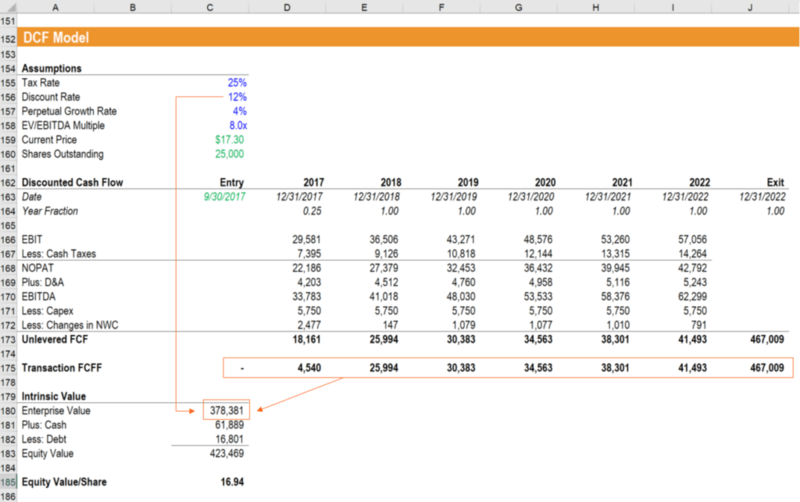 Once all the cash flows are in place, use the XNPV function in Excel to discount the cash flows back to today at the set hurdle rate. If the resulting Net Present Value (NPV) is greater than zero, the project exceeds the hurdle rate, and if the NPV is negative it does not meet it. As you can see in the example above, if a hurdle rate (discount rate) of 12% is used, the investment opportunity has a net present value of $378,381. It means if the cost of making the investment is less than $378,381 its expected return will exceed the hurdle rate. If the cost is more than $378,381 the expected return will be lower than the hurdle rate. Learn more about hurdle rates and internal rate of return in CFI’s financial modeling & valuation courses. How important is the hurdle rate in capital investments? The hurdle rate is often set to the weighted average cost of capital (WACC)WACCWACC is a firm’s Weighted Average Cost of Capital and represents its blended cost of capital including equity and debt. The WACC formula is = (E/V x Re) + ((D/V x Rd) x (1-T)). This guide will provide an overview of what it is, why its used, how to calculate it, and also provides a downloadable WACC calculator, also known as the benchmark or cut-off rate. Generally, it is utilized to analyze a potential investment, taking the risks involved and the opportunity cost of foregoing other projects into consideration. One of the main advantages of a hurdle rate is its objectivity, which prevents management from accepting a project based on non-financial factors. Some projects get more attention due to popularity, while others involve the use of new and exciting technology. What are the limitations of using a hurdle rate? Hurdle rates can favor investments with high rates of return, even if the dollar amount (NPV) is very small. They may reject huge dollar value projects that may generate more cash for the investors but at a lower rate of return. The cost of capital is usually the basis of a hurdle rate and it may change over time. We hope this has been a helpful guide to hurdle rates. CFI is the official global provider of the Financial Modeling and Valuation Analyst (FMVA)™FMVA™ CertificationThe Financial Modeling & Valueation Analyst (FMVA)™ accreditation is a global standard for financial analysts that covers finance, accounting, financial modeling, valuation, budgeting, forecasting, presentations, and strategy. certification, designed to transform anyone into a world-class financial analyst.